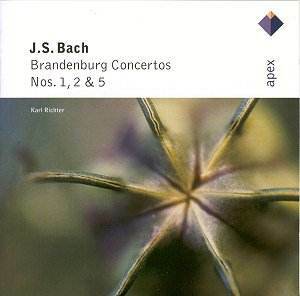 The six Brandenburg Concertos, first printed in 1721, represent relatively early works in Bach�s canon. All were probably compiled, at least in their early versions, by 1717, when he took the post of Cappelmeister in Cothen. Every one of the concertos is a masterpiece of sustained invention that tears up the conventions of the standard concerto grosso form both in terms of harmonic complexity and professional virtuosity. The disc presents three of the concertos, nos 1, 2 and 5, led by the great conductor, choirmaster and organist Karl Richter (1926-1981), who was for a time, like Bach before him, organist of the Leipzig Thomaskirche. This is the first of his recordings, released in 1958. The first concerto is arranged for hunting horns, oboes, bassoon, strings and continuo. From the opening movement it is immediately apparent that the brass section is too quiet, and, at times almost inaudible. The violins are overly prominent, which robs the music of its richness. Indeed the horns should play a crucial role here, initially clashing rhythmically with the strings, later assimilated into the harmony to produce an elegant ending. Unfortunately this is lost and the overall impression is not favourable. The notes specify that concertos 1 and 5 have been electronically "converted" from mono to stereo, which may have caused this effect. The second movement (adagio) contains a beautifully played oboe part, although the tempo in this recording may be a little slow for some. The third (allegro) is also a joy, the strings playful and realistic, although let down again by the indistinct horns. The delightful fourth movement is comprised of a series of dances, and Richter shines here. The oboes and bassoon in the first trio weave an elegant dance around each other, while the horns and oboes play a hunting melody without strings in the second. These interludes are interspersed around an elegant repeated minuet and polonaise. There is much to enjoy in this performance of concerto 1, but I would not recommend it as a first choice for a recording on modern instrument. Instead, I would suggest Britten�s set on Decca from 1968. Concerto no. 2 is written for trumpet, recorder, oboe, strings and continuo. The first and third movements are real lip splitters for the trumpeters. Here, the solo playing is of a very high order, but there are problems with the ensemble, at least one violin not quite in tune. The following andante is quite the most beautiful performance on the disc, however, and as perfect a realisation of this simple but immensely affective piece that I have heard. The third movement, once again, has a superbly played trumpet line which rounds off the work with great energy. Concerto 5, although scored for a more modest group of instruments (flute, strings and harpsichord), contains some of Bach�s lushest and most romantic music. There is a great dignity to the strings and flute parts in the opening section, which eventually give way to an extended harpsichord candenza that is relatively ugly and lifeless. The wonderfully scored affectuoso is also a disappointment, played at a very slow tempo which renders it dull. Finally, the allegro, a playful fugue, rescues the performance from mediocrity. The flute section is very light and the strings assured, providing an impressive finish to a problematic performance. Overall, I cannot recommend this recording, particularly to those unfamiliar with these magnificent creations. However, Richter did revisit the Brandenburg Concertos in 1967, to a far more impressive effect. It should also be noted that the chamber orchestra was, at the time, several years short of developing into one of the great ensembles, the Munich Bach Orchestra. Those who have the later set may want these performances as a comparison set, but I�m afraid that they are best avoided by the uninitiated.